Top row, left to right: Anthony Rentsch of Doherty, Dillon Guthro of Newburyport, Nick Seymour of Marian, Colby Blaze of Barnstable, Jennie Mucciarone of St. Mary&apos;s, Andrew Bolze of Hingham and Shane Farley of Burlington. Bottom row, left to right: Mehki Williams of O&apos;Bryant, Rachael Mara of Wilmington, Lexi Quirk of Needham, Julia Rembetsy-Brown of Oakmont, Abbie McNulty of Bishop Freehan, Yonetta Harris of O&apos;Bryant and Caitlin Harty of Beverly. Harris excelled as a three-sport athlete at O’Bryant while also ranking 11th in her class out of 250. She was a two-time Boston City League MVP in both soccer and basketball, leading the Tigers to City championships in both sports during her career. Harris started at catcher for O’Bryant softball as well, earning 2012-13 team MVP honors, but could not play this spring due to a knee injury. In the fall, she averaged two goals per game this season, finishing the campaign with 22 goals in total. Harris averaged 7 points and 4 assists per game while emerging as a lockdown defender on the hardwood in the winter. With a weighted GPA of 4.02, Harris was leader in the O’Bryant community. “She is always willing to speak on behalf on the school and has been intrumental in recuriting new students,” O’Bryant headmaster Steve Sullivan said. “She truly represents everything I consider the model O’Bryant student.” Harris’ on-field success came while she partcipated in tthe Student Success program at Brigham and Women’s hospital and volunteered at the homeless center Rosie’s Place. She also served on the school’s Student Athletic Adivsory Committee among several other extra curriculars at O’Bryant. While Williams led the Tigers on the gridiron and earned team MVP honors after rushing for 16 touchdowns and 842 yards, the senior also was tops on the squad in GPA this season. Williams ranked in the top 15 percent of his graudating class at O’Bryant and he recorded 30 tackles as the football team’s middle linebacker, too. His athletic prowess also extended to the track, where he earned a Boston Public Schools sprint medley championship, a City silver medal in 4x 100 relay in outdoor track and city bronze medals in the outdoor 100 meter dash and the indoor 4 x 100 relay during his career. His personal record for the 100-meeter is 11.3 seconds. “He is fully present, he is always a gentleman and always greets a familiar face with a smile,” said O’Bryant English Teacher Nora Tsoutsis. Williams used that demeanor to become a leader in the school’s Student Government and Arts Science programs while volunteering around the community with his Church’s youth group. As part of his volunteering, Williams helped the homeless, participated in food drives and sang with the church’s choir at other congregations. Harty ranked No. 2 in her her class of 318 with a 4.67 GPA while serving as a senior captain for the Panthers’ soccer, indoor track and outdoor track teams. She earned 2013 NEC MVP honors this fall while leading Beverly to its first NEC title since 1999 and finished her career with 138 goals and 42 career assists for a total of 180 points. She now holds the school record for all-time goals and points and for goals and points in a single season with 50. Harty’s success translated to the track as well as the seven-time NEC track All-Star anchored the indoor 4 x 800 meter relay team that set the school record at 9:28.70. Her 4:14.25 sprint medley placed 7th at nationals. “She leads by example, always wokring to the best of her abilities,” said Beverly principal Sean T. Gallagher. “Caitlin has been an influential member of her class and a role model to her peers.” Harty is also a National Honor Society Member and President of Fundraising for the organization at Beverly. She frequently volunteers at local foodbanks during her spare time. Guthro was a three-sport captain this year, leading the Clippers in football, basketball and lacrosse. He was name the Cape Ann League Player of the Year and a Globe All-Scholastic in football this fall after recording 135 tackles, three forced fumbles and two interceptions. In the winter, Guthro was a two-time CAL All-League selection and he was named the Cape Ann’s All-League lacrosse goalie leading the team to a 15-1 record with the highest save percentage in the CAL. “His coaches will miss his positive influence, is dedication and his hard work,” said Newburyport Student Support Counselor Patricia Blackstock. Guthro accomplished all this on the field while boasting a 3.7 GPA in challenging honors and AP courses. After school, Guthro volunteered as a youth football, basketball and lacrosse coach. Guthro will be continuing his football career at Bryant next season, focusing on the gridiron over basketball and lacrosse. One of the top quarterbacks in the state, Farely capped off his football career with over 2,000 yards passing and a school-record 22 touchdowns this season en route to a Middlesex League All-Star nod. This winter, he was named the league’s Freedom Division MVP in basketball, culminating a stellar career in which he scored 1,249 career-points in basketball and set a school-record by dropping 50 points in one game. “Dedication, commitment, and hard work turned Shane into the most productive basketball players in the history of Burlington High School,” Burlington coach Thomas Lyons said. “Shane has been like a coach on the court and in the locker room.” As a student, Farely is a member of the National Honor Society and won one of the school’s most elite accolades, the Scholarship, Integrity, Leadership and Integrity award. He was a volunteer coach for the Burlington Pop Warner and at multiple summer basketball camps while also serving as a volunteer at the Special Olympics. Still, he managed to excel in the classroom, earning a 3.25 GPA and ranking 86th in his class of 258. The National Honor Society member is a multi-time Middlesex League All-Star in soccer, basketball and lacrosse, earning league MVP honors for basketball in 2013-14 and for lacrosse in 2012 and 2013. Mara totalled 21 career goals and added seven career assists in soccer, averaged 10 points and 8 steals per game in basketball, and truly excelled with a lacrosse stick in her hands. She scored 218 goals over her three-year career. She was selected to represent Wilmington at the National Girls and Women in Sports Day in Boston this year. “She is an athlete, scholar, active citizen, leader, good sport and consumate team play,” Wilmington soccer coach Susan Hendee said. In the classroom, Mara has a GPA of 3.66, good for the top 20 percent of her graduating class of 215, an is a National Honor Society member. She was a board member of the Rotary Interact Club, which serves the Wilmington community by assisting the elderly, organizing a road race and serving meals to families in town. A two-time All-American and the 2014 Boston Globe Track and Field Athlete of the Year, Bolze athletic career at Hingham can be summed up in two words: record-breaking. He holds 12 Hingham records, a New England record in indoor long jump and the Mass. state record in the 300-meter. Bolze was a three-time New England Champion, three-time Mass. All-State champion and a two-time Globe All-Scholastic Winter Track team selection. Meanwhile, off the field, he was the first chair cellist of Hingham’s Chamber and Symphony Orchestra, a National Honor Society member and an Ambassador for the White Ribbon Campaign against Domestic Violence. “Andrew’s talents extend in so many directions, no one would blame him if he were a braggart,” Hingham english teacher Annmarie Fennelly said, “But the fact that he is such a soft spoke and humble young man makes him all the more appealing as both a leader and a friend.” He earned a 3.88 GPA and scored a 2050 on his SAT. 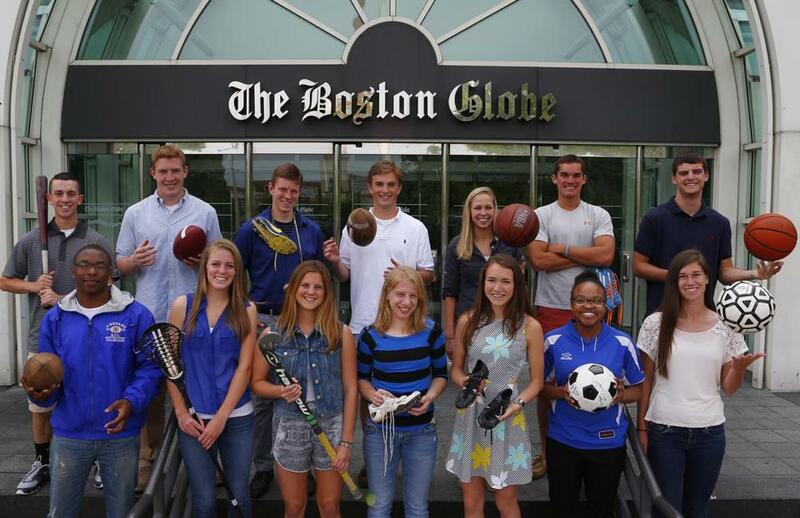 A 2013 Globe All-Scholastic in field hockey after earning 2013 Bay State Conference Carey Division MVP honors, Quirk was also named a US Lacrosse Academic All-American during her decorated high school atheltic career. During her MVP senior field hockey campaign, Quirk scored 23 goals and added 21 assists. In the winter, she spent two years playing ice hockey and one year running for Needham’s indoor track team, running the 300 meter, 600 meter and 4x4 relays. Quirk worked for a 4.48 weighted GPA in the classroom and peer-tutored younger Needham High School students three times a week. She’s a member of the school’s VIP Program, a service geared toward providing elementary school age students with a high school student role model ti meet once a week, as well. “I believe that Lexi’s personality, leadership, motivation and worth ethic helped make the Needham field hockey team as good as it is and she is leaving a huge legacy behind her,” Neehdam field hockey coach Stephanie Magni said. Valedictorian of his class of 335, Blaze was also three-sport athlete at Barnstable. He was named an OCL All-Star in both football and tennis and served as the basketball team captain this year. In tennis, he boasts a 67-4 individual record in first doubles. His tandem helped Barnstable earn a 17-0 regular season record and the top seed in the Division 1 South tournament in which the Red Raiders reached the title match. Playing cornerback, Blaze recorded 37 tackles, had two fumble recoveries, one interception and one fumble return for a touchdown. His 4.72 GPA was tops in his class and he backed it up by scoring a 2300 on his SATs. Outside of Barnstable, Blaze was a reiligous education teacher and lecter at Our Lady of Assumption Parish. “The antithesis of the stereotypical ‘jock,’ this three-sport captain, president of the class and role model for the youth of our community sends the message that achievement and maximizing your potential should be the norms,” said Barnstable pricinpal Patrick Clark. A Globe All-Scholastic for cross-country and three-time Globe All-Scholastic for indoor track, McNulty will continue her running career at Stanford on a full scholarship. She holds school records in the indoor mile and 2 mile and outdoor 2 mile while boasting a 10:28 personal record for the 2-mile. McNulty led the 2-mile by nearly 22 seconds at the spring All-States. Meanwhile, she ranks in the top 10 percent of her class of 265 with a 3.9 unweighted GPA and is a National Honor Society member. After school, she is president of Bishop Feehan’s French Honor Society and STAND, a chapter of the national organization STAND for DAFUR. “You can imagine how many hours and hours that Abby must devote to both training and schoolwork, but then she also has made the time to help others,” said Bishop Feehan principal George Milot. McNulty managed to excel in all these aspects while taking two honors and 3 Advanced Placement courses. Valedictorian of her class with a 4.11 GPA, Rembetsy-Brown earned Wachusset League C co-MVP honors in soccer this fall and was a three-time league All-Star in both indoor and outdoor track. She scored 12 goals her sophomore year and, after tearing her ACL her junior year, returned to the soccer field to score 18 goals her senior season. On the indoor track, Rembetsy-Brown qualified for States and All-States in 8th, 10th and 12th grade, totalling 130 career points. During her outdoor track career, she qualified for States and All-States her freshman year and States for her sophomore and junior year efforts. Off the field, Rembetsy-Brown was an MIAA Student Ambassador and National Honor Society member. “She has demonstrated a unique ability to make a commitment to an organization, be it athletics or co-curricula, and manage her time wisely to fully honor that committment and be successful in the classroom,” said Oakmont Pricinipal David Uminski. A multi-time Catholic Central League All-Star in cross country, indoor track and outdoor track, Seymour put together a decorated high school career in which he captured five different championships. Seymour qualified for numerous All-State championships and boasts a 5K personal record of 16:48.90. He also ranked second in his class of 86 and was a three-time class president. He was president of the school’s National Honor Society chapter while volunteering in Marlboro Public Schools Special Education summer programs as well. “I have been teaching for 41 years, and I am hard pressed to hink of another student who has shown more maturity, sensitivity and awareness of the wider world,” said Gerard Herlihy, Chair of the Marian English Department. “He not only is aware of larger problems in the world, but is already engaged in dealing with them.” As president of the NHS, Seymour led a large initiative to raise money for Food for the Poor this spring through various fundraisers.